Why can’t we have proper snow? I’m not in a very good mood today. It’s finally winter in Dublin. It’s really cold and it’s dark all day and I can’t go anywhere in case it rains on me and I end up clean… There are only two good things about winter and neither of them have appeared yet. The first is hot chocolate, I love it but Mummy hates the smell so I can’t have it in the house. The second is snow! I saw some on the television but there’s none in my garden 🙁 I’m very disappointed because the last time that we had snow here I got to go outside and build a snowman. I also threw snowballs at the squirrels but don’t tell my Mummy! I nearly hit her with one by accident and I had to pretend that it was the squirrels that were throwing them! Here’s a picture of the snowman that I built last year. Ted says that he helped too but I was the artistic genius behind it of course. I may also have been responsible for eating the snowman’s buttons but we won’t mention that. I can only think of two solutions to my current problem, how to spoil things for Ted and his snow. I’m either building a giant microwave machine to melt Ted’s snow or I’m breaking into every house in Dublin tonight to open their freezers and make the snow come here. But first I think I need a nap, that all sounds like terribly hard work. 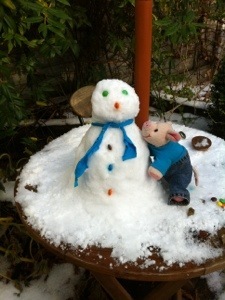 This entry was posted in Uncategorized and tagged Snow, snowman. Bookmark the permalink.